For the 33rd consecutive season, Tennessee has a member of an All-SEC team. Robert Hubbs and Grant Williams earned all-conference honors this week, per a conference release on Tuesday. 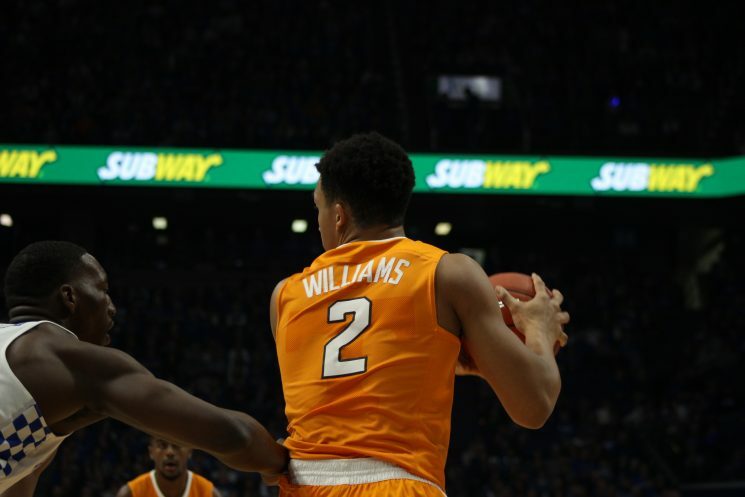 Hubbs was named Second Team All-SEC, while Williams made the All-Freshman team. Hubbs was Tennessee’s leading scorer in the 2016-17 season, averaging 13.9 ppg. Despite dealing with multiple injuries throughout his career, Hubbs became the 48th member of the 1000-point club this season. Grant Williams is the first Vol to earn All-Freshman honors since Jarnell Stokes in 2012. The Charlotte, NC. native averaged 12.8 ppg and 6.0 rpg. Williams also set a new record for most blocks by a freshman, recording 60. Williams also posted three double-doubles in Tennessee’s last four games, including the Vols’ Senior Day victory over Alabama last weekend. Hubbs and Williams will lead Tennessee against eighth-seeded Georgia on Thursday at 1 p.m. ET in the first round of the SEC Tournament.